A controlled explosion has been carried out on a World War II bomb found in Coventry city centre. The bomb was discovered on Wednesday morning by construction workers at the site of a new hotel. Police set up a 500m exclusion zone as a precaution and offices, flats, hotels and a theatre were evacuated. Cordons were lifted after the device, found at the Belgrade Plaza development in Upper Well Street, was made safe just after 0240 GMT. About 140 people had to spend the night in rest centres set up by the council at Queens Road Baptist church and St Peter's Church in Hillfields. 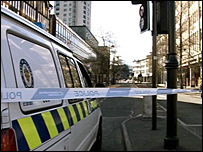 The cordons had been put in place around Upper Wells Street, Corporation Street and Lamb Street. The ring road was also affected. Car park operators have said they will not charge people who were forced to abandon their vehicles overnight. The exclusion zone also meant the Coventry Evening Telegraph offices and Belgrade Theatre were evacuated.